Range: Atlantic coast of Georgia in to Texas and all the way down to the Gulf of Mexico and the northern coast of Brazil. Habitat: Brackish water, swamps. 1-100 feet down. Diet in the wild: Small shrimp, and anything else that can fit in its mouth, except fish. The Dragon Fish can get up to 15 inches long, but has been known to reach 2 feet, and even longer in the wild. Dragon Fish have very small eyes and therefore it is hard to find their food in wild life. It can get about 1 pound heavy because of its fairly dense body. It resembles an eel with dorsal and ventral fins running the whole length of its body. Color: Gray and shining scales on the face. 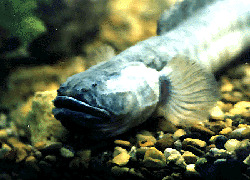 Dragon Fish live in brackish water. 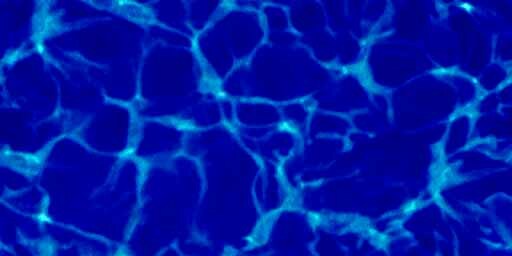 This means that the water is a mix of salt and fresh water. They are very peaceful even though they sometimes might appear to be lethal predators. This fish is really ugly but it is still very interesting, almost charming. It is a member of the family Gobidae, and the American Fisheries Society has given it the official common name of the violet goby. The only reason why people call it the Dragon Fish is because they want to sell more of it; the name makes it sound interesting. The Dragon Fish is not a "hunter"; it feeds on other fish that are sick or it eats bugs and other insects in the water. The reason why its body is shaped like a torpedo is because they have to hide from predators. They climb into small cracks in rocks and hide there; this behavior can be seen with most eel and snake species that also have the same body frame. Dragon Fish are not very friendly when it comes to other fishes; it marks its territory and lets nobody in there. Gobies in general often enter into restricted symbiotic relationships with each other, which is why it can be so hard to mate them in captivity. The Dragon Fish at the Fort Worth Zoo is a female and it was brought to the zoo 3 years ago. It came from the Atlantic Coast. It is very hard to breed the Dragon Fish in captivity and they have still not been able to do so at the Zoo. As I was studying the Dragon Fish I noticed that it hardly never swims around. Instead it "runs" along the bottom of the tank on its lateral fins. 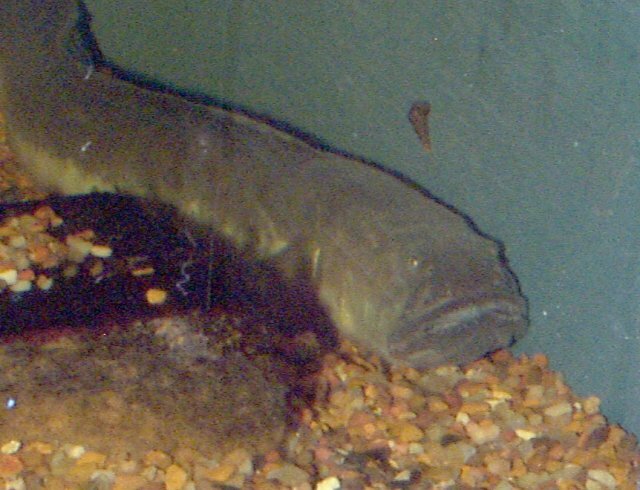 It has a very large mouth and it looks like it could swallow a small fish in a bite. It is hard to believe that a Dragon Fish it is not aggressive when you look at it because it looks almost like an old dragon. Exhibit of the Dragon Fish at the James R. Record Aquarium. H.Dickson Hoese and Richard H.Moore. Fishes of the Gulf of Mexico. Texas A&M University Press, 1977.